I have read a lot about Saratoga and of course have seen the races on TV, but after hearing about how great it up there I decided to go up there. 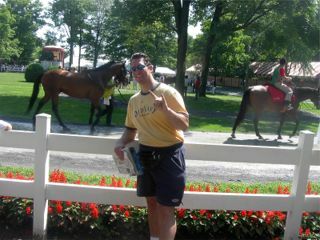 On August 13, 2003, me and my girlfriend hopped in our rent a car and headed up north for a 4 hour drive to Saratoga. We got to the track around a little after 12pm and the place was jumping already. This place is huge and huge again. Tons of places to eat and drink. Over 22,000 people on this very hot Wednesday afternoon. The atmosphere is cooking too. Now the track was sloppy, but the races were still on the turf. Race 31 is a steeplechase race and I put the #1 horse with Danielle Hodson on top in an exacta with 2 other horses. Danielle is dead last most of the way, but she just gets up in the last stride and wins going from last to 1st. I don't have the exacta, but I watch as a very happy Danielle comes back to the winner's circle. I talk with Danielle after the race and congratulate her on her 1st winner ever at Saratoga and also get my picture of me and her from Colonial Downs signed as well. Race #2 is a 1 mile and 1/8 allowance with a purse of $48,000. A 6 horse field and I played a 2/5 with 2/5 with 3 trifecta. Jose Santos has the #2 horse up there and he quits and Edgar Prado goes on by and nips him at the wire. Had the right horses...wrong order. Race #3 is 5 furlongs for maidens with a purse of $45,000. I play an exacta with Jerry Bailey on top and John Velazquez for 2nd. Jose Santos on the #7 goes wire to wire and I lose ha ha. Race #4 is 1 mile and 1/8 with a claiming price of $24,000. Placed a straight exacta with Shaun Bridgmohan on top and a Suffolk Downs shipper who has done good in the slop for 2nd. The Suffolk Downs horse should have stayed there as he ended up dead last and my other horse naturally wins and a 50-1 finished 2nd. Race #5 is a 5 horse field going 1 mile and 3/16th on the turf course. The graveyard of favorites tag runs true again as I play a straight exacta 5 and 1 and I didn't box it and the #1 horse wins easily. Race #6 is 6 furlongs and I play Jerry Bailey and throw $5 to win on him and his horse doesn't have it and Edgar Prado does and wins and I lose. Race #7 is 1 mile and 1/16th on the Mellon Turf course. Allowance race with a purse of $50,000. A foreign horse with 21-1 odds comes off the pace and wins easy. No, I didn't have that neither. Race #8 is $150,000 Grade II race going 6 1/2 furlongs. 2 horses are undefeated and one horse won by like 8 lengths in the slop at Monmouth. I play all sorts of different trifecta combos and Jerry Bailey who I only play for 3rd in my trifectas, come up and beats me and I lose. Every one of my beats had the right numbers, but in the wrong order. I decided to beat some of the traffic and we headed on home. I didn't cash a ticket, but I had a great time and I am sure I'll be back next year. See ya in the winner's circle.